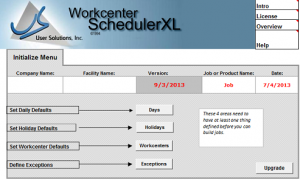 Workcenter Scheduler XL(WCXL) is a high performance planning and scheduling offering for Job Shops, Fabricators, Service/Repair Shops, and others where customer service and shipping on time is vital. WCXL will enhance the effectiveness, efficiency and consistency of your Workcenter based planning and scheduling, including cycle time reduction. WCXL features an easy-to-use method to enter resource definitions, then to build/define jobs, or projects, with additional considerations such as labor and workcenter operations and routings. Next, WCXL allows you to perform ‘what-ifs’ with different plans — resulting in feasible and effective production schedules. Strategic management information, such as on-time shipments and ‘late’ reports to assist in optimizing operations. One step menus, on-screen buttons, or sheet tabs make navigation a snap. Quick, intuitive layout and prompts allows you to focus on your business, instead of learning another software product. Global and/or detailed workcenter configuration can be made and applied instantly. WCXL is a most affordable and easy approach to enable you to more effectively plan and execute your company’s production requirements. Quickly define all of your labor and workcenter resources and build jobs. Easily include time estimates and sequence of operations. Print out reports summarizing what needs to happen, when, and what quantity. Is there a problem meeting the schedule date? If so, delay the Job with a click. Need to change priority and reschedule? Simply reschedule in new order and let WCXL take care of the details. The first stage consists of default definition., including: Global daily defaults, Holidays, Workcenters defined, and exceptions list (for automatic reporting on delays at workcenters). 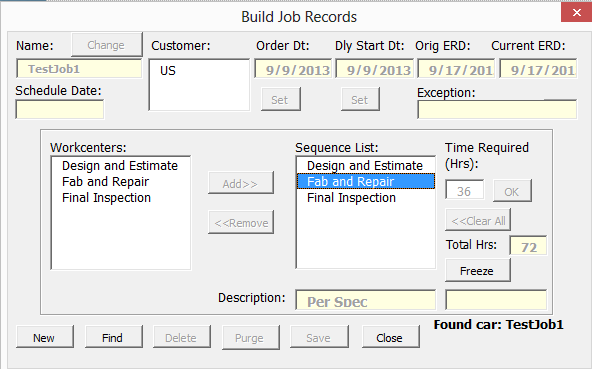 Then Jobs are ‘Built’ with Customer name, Job Number, start date, and a super easy method for sequencing workcenters. Next, the newly built Jobs are sequenced and schedules are created. The user has the freedom to try various quantities, with alternate start dates, and view the resultant summaries of resource requirements and schedule dates. It is in this phase that capacity constraints are revealed — as well as when labor and machine resources should be scheduled. Each schedule can either be viewed on screen or printed. The result of this second phase is an accurate production plan start and stop dates, and critical time path to successfully meet due dates. The third and final stage consists of using and reporting on the schedules created in stage two. By design, WCXL does not require updates to actual schedule – but allows you ‘by exception’ to flag jobs that are delayed and report on the cumulative effects of all delays. When the exceptions (or any other event) warrant that some Jobs need to be rescheduled, WCXL features an easy single click method to remove one or more Jobs from existing schedule, arrange new priority, and reschedule. Easy shipping and comprehensive reporting round out the WCXL system. The dynamic screens that display the visual schedule in Gantt Chart format, along with the Resource Loading Chart that shows a color coded key to hours loaded and hours available by Workcenter by Day, are the key interfaces for daily interaction with the WCXL system. These two screens are automatically updated by the WCXL system anytime a schedule is generated or changed. In addition to the live schedule and resource loading, WCXL contains several easy-to-use and intuitive reports to convey important management and system information. The reports are run from the menu bar, and once run, can be accessed directly and instantly by worksheet tabs. All reports feature an easy to read standard layout, printing, and graphing. In addition, the user has full access to perform any custom formatting on cells, rows and columns using the standard options off Excel Format menu. This report shows the Capacity Defaults for each workcenter per each new configuration date. This report may be run for either a single Job, or a batch of Jobs as indicated on the Menu. This easy to read report can include a custom graphic and displays the job sequence, time at each workcenter, and estimated Job completion date. This report, with a default of today’s date, generates a listing of Jobs by workcenter including, date in, hours remaining, date out, and the previous workcenter. Any ‘delayed’ Jobs will be displayed. The WIP Report can be run for any day. This report shows the estimated ship date for all jobs, which have not yet shipped. This report shows the number of Jobs which pass through each workstation each day. This report, uses the same format as the Throughput Report and shows performance data of utilization combined with backlogs per workcenter by day. This report compiles a list of exceptions, the time delayed of each, and the total number of occurrences and average time delay for each exception type. This report shows the number of active Jobs which exist in the system. This report shows performance data on Jobs which have been shipped. A Pareto chart, showing the frequency of standard Exceptions cited in shipping delays, is available on the Shipping Report sheet. The sheet includes a chart of five columns labeled, Job ID, Workcenter, Interrupt Date, Resume Date, and Comments. During scheduling, any Job that is interrupted at a work center (because a higher priority Job has already been scheduled there in the midst of its multi-day processing period) will be listed on this chart. Freezing a Job at a Workcenter during Rescheduling. To allow for an accurate, up-to-date schedule, the user can now call up any Job and update when complete. This new feature, called ‘freezing a Job at a Workcenter’ enables the user to track exactly when a workcenter has completed a job and then is able to reschedule WCXL. To freeze the job at a workcenter select a workcenter in the sequenced workcenter list and click on the Freeze button. 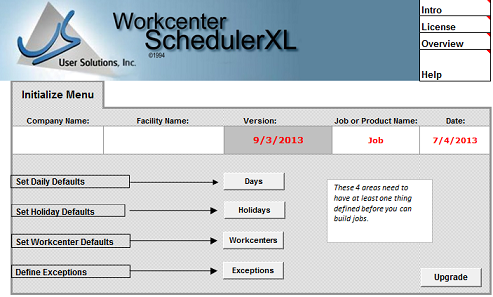 The calendar form will appear, with the workcenters current end date selected. The user may select another date and the change will immediately be written to file; it is not necessary to save the form afterwards. The selected workcenter name now appears in the textbox under the freeze button. 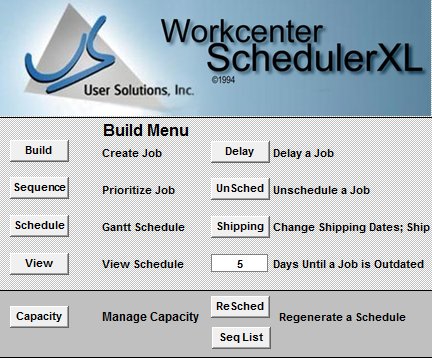 Rescheduling WCXL containing jobs with a frozen workcenters locks in the hour assignments in the resource calendar for workcenters previous to and including the frozen one. Then, the remaining workcenters are rescheduled according to priority order, capacity available, etc. The user can also unfreeze the job by clicking on the freeze button which is now titled “unfreeze” when the job has been unscheduled. In summary, with the Priority List, Workcenter Tracking, and ability to Unschedule andor Reschedule any Jobs with a click of the mouse, WCXL will exceed your expectations for a planning and scheduling system that is powerful, accurate, and easy-to-use. WCXL now combines the quick planning capabilities with the ability to track actual Jobs, define priority lists, and reschedule as necessary to adjust to actual day-to-day interruptions to planned schedules. If your routings are not linear (one after another, single branch), or if you have more advanced scheduling and tracking requirements, or need more flexiblity for data integration with other systems, or need multi-user access (instead of one person with edit control and others with read only), we highly recommend you take look at Resource Manager-DB. We’d be glad to meet with you and run through that system with YOUR data and solve your most pressing challenges in the easiest way possible!